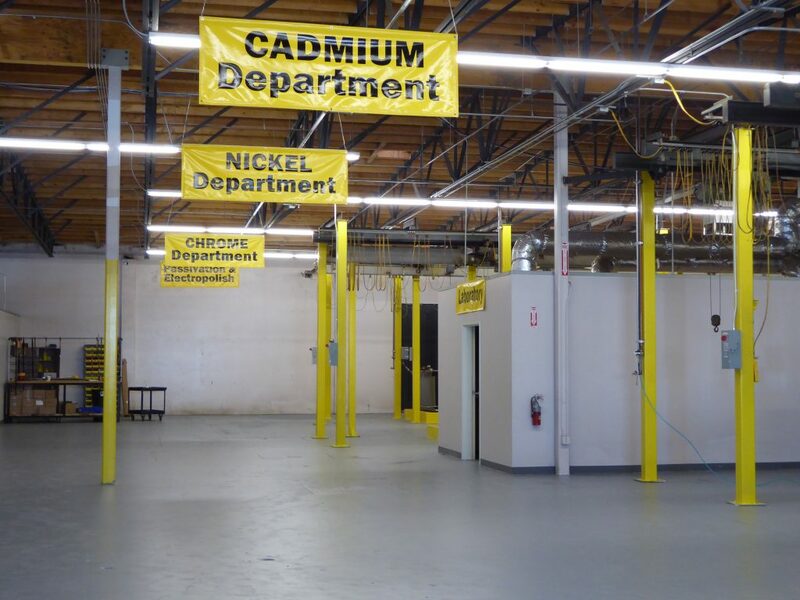 With over 15 years of experience in the Metal Finishing Industry and backed by a firm Quality Assurance Program, we are committed to customer satisfaction. We Welcome any challenging project you may have, no matter how complex or difficult it may be. Our technical resources & work force, are both focus on high quality standard and excellent customer service. Embrittlement relief is performed in walk-through oven running 24 hrs. a day to ensure that the rigid spec requirements for high-strength steels are met. Parts are embrittlement relieved per spec after all plating operations. Magnetic Particle Inspection checks for cracks in steel parts on our 8' Magnaflux Machine. The part being inspected here is the MD-11 Wing Slat Drive Crank made from 4340M. Nital Etch is performed in our 4x8 tank inspection. Nital Etch verifies that the parts were not over-heated during machine and grind operations. Low Embrittlement cad and bright cad are performed in our 4x8 tank. We have a Nadcap approved lab to analyze the tanks chemistry. Chrome Plating is performed in one of three 10' deep tank. Chrome thickness is monitored to minimize the amount of grinding required. Our filtered-air paint room can accommodate the largest landing gear components. two L-1011 main Landing Gear Side Braces are shown in this picture.